Daylight Savings has finally arrived! And I could not think of a better reason to lose an hour of sleep and wake up a little groggy. Because I don’t know about you, but I’m one of those people who feels like the extra hour of daylight in the evening is freaking life-changing. I mean, sure, I’m all for some extra sun shining through my window in the mornings to help get me out of bed in the winter. But if given the choice between sun in the morning, and glorious, warm, bright, makes-you-feel-like-there’s-actually-more-of-the-day-left in the evenings after work, I will choose DST any day in a heartbeat. (In fact, yes, I’m totally one of “those people” who wishes Congress would let us keep saving daylight year-round….) But in the meantime, I’m fully appreciating every second of these sunshiny evenings that celebrate the beginning of this warm season to come. And one of my favorite things to do when it’s light out in the evenings? You’d better believe it — cook! 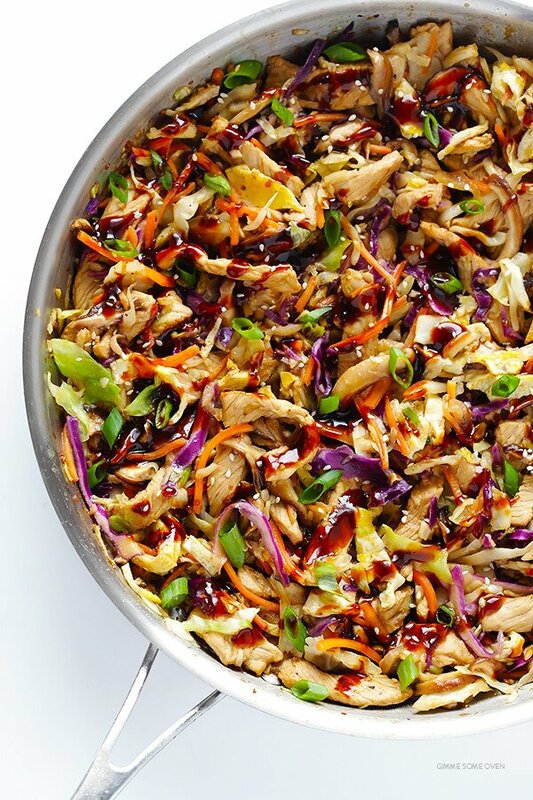 It nearly felt like summer here last night, so I decided to whip up a quick batch of my new favorite “better than takeout” recipes that I’m recently obsessed with making — moo shu! (Or moo shoo, mu shoo, it seems that the spelling options are endless.) It has been one of my long-time favorite dishes to order when I’m doing Chinese takeout. And after studying the ingredients, I recently decided it was worth a try to make at home. Instead of taking the time to chop up a green and purple cabbage and some carrots — you guessed it — just buy a bag of your favorite cole slaw! (Organic, if you can.) I found one with green and purple cabbage, but either or both colors will do. I really loved the pop of the purple against the other colors. Instead of chopping up a bunch of mushrooms (and traditional moo shu uses shiitake and wood-ear/black mushrooms), I just went for the prepared package of thinly-sliced shiitake mushrooms. If you can’t find them pre-sliced, you can obviously slice them yourself. And if you can’t find shiitakes, white button or baby-bella mushrooms will also work. Instead of taking the time to make those homemade flour Mandarin pancakes — which I love at Chinese restaurants — I took the easy route and just used some Mexican flour tortillas. Not quite the same, but still delicious and ultra-easy. Other than that, the basic stir-fry instructions are pretty simple! 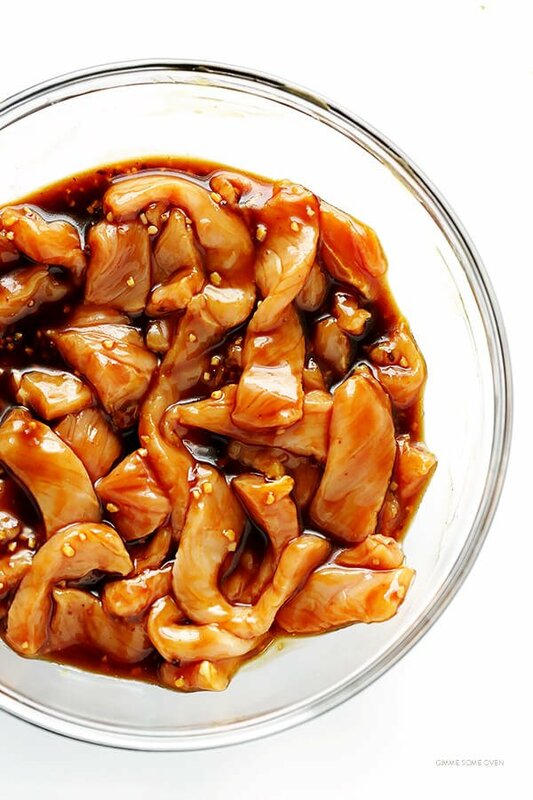 Just whip up a simple marinade, and toss half of it with your thinly-sliced pork or chicken, setting aside the second half of the marinade to be used in cooking. Then while the meat marinates, cook your eggs. And then saute the meat (discarding its marinade). And then saute the veggies. And then toss the reserved marinade in the pan and saute everything all together until it’s cooked and evenly-coated in the sauce. Then, this rainbow of deliciousness if going to be yours to enjoy. Serve it up in some flour tortillas, or lettuce cups, or over a bed of rice, or whatever sounds good. 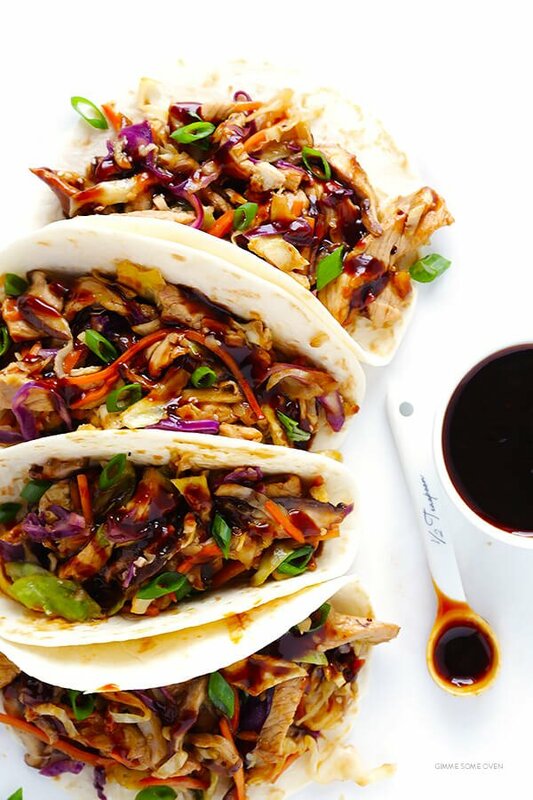 Then drizzle with a little extra hoisin if you’d like. And voila — a delicious batch of homemade Moo Shu is ready for dinner! Totally easy. Totally colorful. Totally packed with veggies and protein. And totally delicious. Enjoy! And happy DST to all of you! 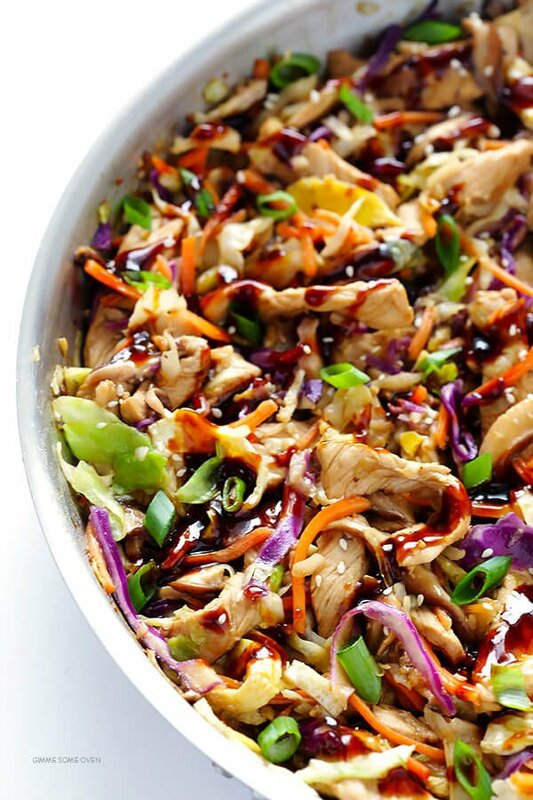 This 20-Minute Moo Shu Pork (or Moo Shu Chicken!) recipe is quick and easy to make, full of fresh and delicious flavors, and it tastes just as good as the restaurant version! Whisk all ingredients together in a medium mixing bowl until combined. Separate the marinade into two portions — one to marinate the meat, and one to serve as the cooking sauce. Add the thinly-sliced pork (or chicken) to half of the marinade, and toss until the meat is evenly coated in the marinade. Set aside for 5 minutes. While the meat is marinating, heat 2 teaspoons oil in a large saute pan or wok over medium heat. Add the whisked eggs, and let them sit and until they are cooked and form a large omelet. Transfer the eggs to a separate cutting board, and set aside. When you have a chance (while the pork is cooking), chop the omelet into small, thin pieces. Return the pan to the stove, and increase heat to high heat. Add 1 more tablespoon of oil, and then use a pair of tongs (or a fork) to lift the meat out of the marinade and transfer it to the pan, discarding the marinade. Saute the pork, breaking it up and stirring it with your tongs occasionally, until it is cooked and tender, about 3-4 minutes. Then transfer the pork to a separate plate, and set aside. Add the remaining oil to the pan, along with the cole slaw, mushrooms, and half of the scallions. Saute for 2-3 minutes, or until the cabbage begins to wilt and softens. Add in the reserved marinade for the sauce, and toss to combine. Cook for an additional 2 minutes. Stir in the cooked pork and chopped eggs, and toss until combined. Taste, and season with extra salt and pepper (and/or hoisin or soy sauce) as needed. Sprinkle with the remaining green onions. Serve immediately with flour tortillas (or lettuce cups, rice, or quinoa), and garnish with optional toppings if desired. I just drizzled some extra (warmed) hoisin on top of the skillet before serving, and also drizzled a little extra on the tacos because I’m obsessed with hoisin. But feel free to just use as little or more as you’d like. Recipe slightly adapted from The Food Network and The Woks Of Life. This is indeed a rainbow of deliciousness! I must finally get the hoisin and oyster sauces so I can make these! Thank you for your sweet words, Pam — we’re so glad you enjoyed this! Trying out your recipe tonight with high hopes! We hope you enjoyed it, Kate! Hi Ali, made this tonight with broccoli that I grated in the food processor. Awesome as always! There is one thing I’m confused about. How much rice vinegar is this calling for? I’ve never seen anyone refer to 1/4 Tablespoons so it looks like a mistake. Could it be a quarter Tbs really? Or is it really 1/4 cup? Or is it really from 1 to 4 Tablespoons? Since there are 2-1/2 tsp in one Tablespoon, 1/4 Tbs would be 5/8 tsp, but most cooks would just say 5/8 tsp, even though that seems ridiculously exact. I’m going to make it by taste, since I’m not expecting yo will reply tonight. Hi Nan! Oh my goodness, we’re so sorry, that was definitely supposed to read 1/4 cup, not 1/4 Tablespoons! That was a huge error on our part, and we apologize for the mistake. We appreciate you bringing this to our attention and we hope you enjoy the recipe! I have nothing in the house right now and I would so love to sink my teeth into these!!! They look so delicious! Thank you for this recipe! Had fresh red & white cabbage on hand so I sliced and diced myself! Made homemade MooShu pancakes and it was wonderful! Oh thank you thank you! Moo shoo pork has always been the dish my mom and I would share from our favorite local Chinese restaurant. My mom passed away three years ago this month and the restaurant closed its doors. Since then it’s been impossible to find a replacement for Yen Chings Moo Shoo. This recipe hit the spot tonight! I threw in some local farmers tatsoi, brussel sprouts in lieu of cabbage. Sharing this dish with my girls tonight tied my past to my present. No photo though, somehow it went from the sizzling skillet to empty sauce-smeared plates in no time! We’re sorry to hear that, Katy, but we’re so happy you and your girls enjoyed this recipe! Thank you for giving it a try and for taking the time to comment! This recipe is AMAZING! I live in a small town with not many restaurant options. There used to be a Chinese restaurant here that made the best moo shu pork. It closed many years ago and I haven’t had it since. This taste EXACTLY like it! It is so so good! Thank you! I like to make this with leftover ham which gives it a bit of that smokey flavor and it’s totally a shortcut- no pork to marinade. Thank you so much, Shirley, we’re happy you loved it! Thanks! my mom used to make this as a kid, from scratch. I never made it due to the work involved. So much easier. I use that asian mushroom, fungus, whatever it is, called in Mandarin, “Mo’or” that my mom used, and more egg. But it was on point good, thanks! This is hands down one of the best recipes I’ve made in a while! My bf was so impressed with how it turned out and now we make it every 2 weeks. I subbed a broccoli slaw for coleslaw (as the grocery store was out and I didn’t want to lug/clean my food processor) and served them taco style with corn tortillas. Thank you, Sabrina, we’re so glad to hear you and your boyfriend enjoyed it! Thank you, Patty, we’re so happy to hear that! 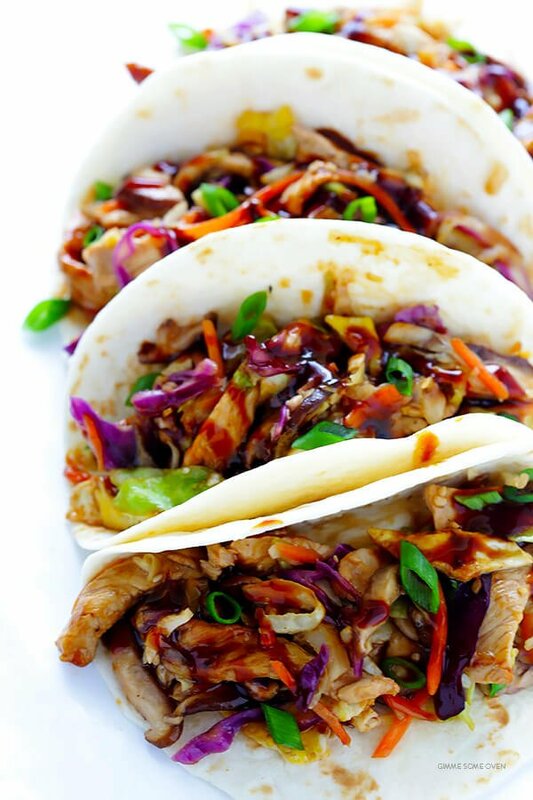 This recipe makes a very tasty moo shu pork!!! It took me way longer than 20 minutes, but it was worth the time. Very good. Wouldn’t change a thing. I made this last night and although it took me a little longer than the stated time, the results were amazing! It was so good! 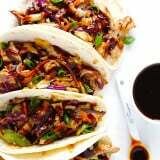 One of my favorite things to order at Chinese restaurants is Moo Shu Pork and this recipe is pretty darn close! Now granted, the tortillas aren’t wafer thin as the ones the restaurants provide, but I very easily could use wonton wrappers next time. 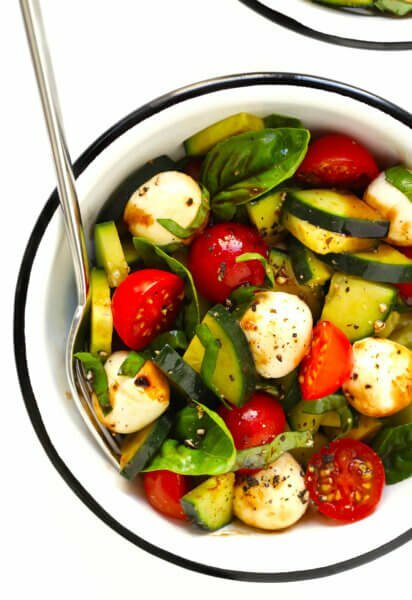 Don’t hesitate making this dish…. you will be pleasantly surprised!! We’re so glad you enjoyed it, Cindy, thanks for your kind rating! just made this!!! it was sooo good!!!!! will def be making it again. Ahhhh, awesome! Thanks so much for giving it a try, Molly. :) Hope you’re having a great summer! Can’t wait to try this one bc other than the veggies (which I can easily pick up tomr) I have all this stuff on hand pretty much every day. Always have fresh ginger in the freezer –great trick if you’ve never tried it — can’t wait to whip this puppy up!! I’m so glad found this recipe. It was delish. Was because it’s gone. Thanks again. Definitely will be a regular for me to scrounge up. I just made this and it was amazing. I did make one little change and made garlic scallion crapes for my wraps. My husband loves this. It is pretty good, but I wish it was a little lower in fat. This was delicious! We didn’t have other sauce so we left it out and it was still fantastic! Great over rice! Made this according to recipe. 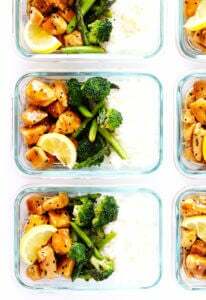 Super easy, quick and very good. I will make this again. Leftovers were also tasty! I just made this and it is delicious! I didn’t have sesame oil so I didn’t add that. I used less chicken but used the same amount of mushrooms (maybe a little more) and Cole slaw mix. It was really really good. Next time, I’m going to add more ginger and maybe some snap peas or bell peppers for a crunch. It tastes delicious with a toasted tortilla or rice. Also, it reheats beautifully. So good! My husband loves it. 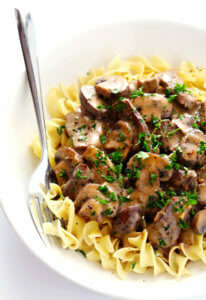 Came across this recipe while looking for something special to cook my hubby for his birthday. Was very pleased with the taste and relative ease of cooking. Such a great recipe!